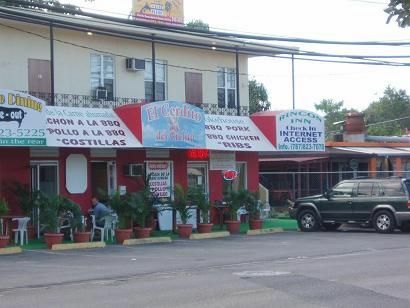 The Rincon Inn is a newly remodeled, small inn less than 2 blocks from one of the finest sandy swimming beaches in PR. It contains 11 suites, 2 of the 2 room suites have been reserved for 8 hostel beds. 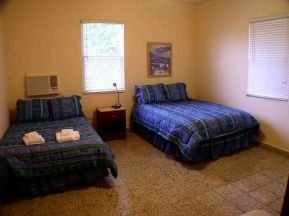 All of the suites have airconditioning, cable tv, their own bath and kitchenette (coffee maker, toaster oven, microwave and refrigerator. The building contains an internet cafe with ice cream, sandwiches and a used book store. Rincon, located on the W coast of PR is the surf capitol of the carribean. Rincon is a small town on the ocean where the emerald hills roll down to the sea. It has a large expat community and several great bars and restaurants since it is a building tourist location. It is the premier diving and surfing destination in PR with great shore diving and snorkling and offshore and island diving where the visibility usually exceeds 100'. It is a great fishing and whalewatching spot as well. 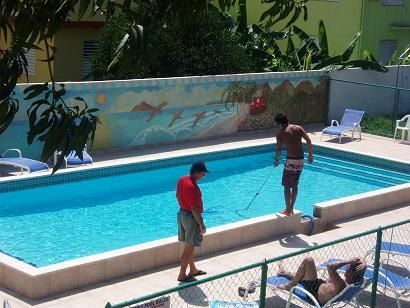 There is horseback riding in the jungles and along the beach, great inexpensive golfing, a public gymn and tennis courts, cave exploring, hiking and biking. The people are friendly and you can easily get around with English or Spanish. It can be inexpensive, beer in the local bohio $1, rum drinks $1.50 and a ham, egg and cheese breakfast sandwich in the local bakery is $1.50. Lots of roadside stands where a pincho (chicken or pork shish-ka-bob) is $1. Rincon is a beautiful spot with lots to do and a temperature of 80-90 and an ocean temperature of 80 or more. Follow the signs from the airport that says RT. 26 San Juan toward Bayamon. Rt. Turn exiting airport and keep RT. Rt. Turn at (tunel minillas). Follow signs that say RT. 22 Oeste. Keep to the right you are headed to Mayaguez. This is the autopista with 6 tolls. Stay on it and bear to the left toward Aguadilla and Mayaguez on Hw 2. You are about an hour away. You will pass Aguadilla and enter the town of Anasco. Turn right on Rd #402. There is a stoplight and a McDonalds on your right. Follow until the end and make a right on Rd. # 115. You will pass a Burger King and Churches Chicken on your right. About another 3 minutes you will see the Rincon Shopping Center on your right and we are on the left. Next to El Cerdito del Cielito.